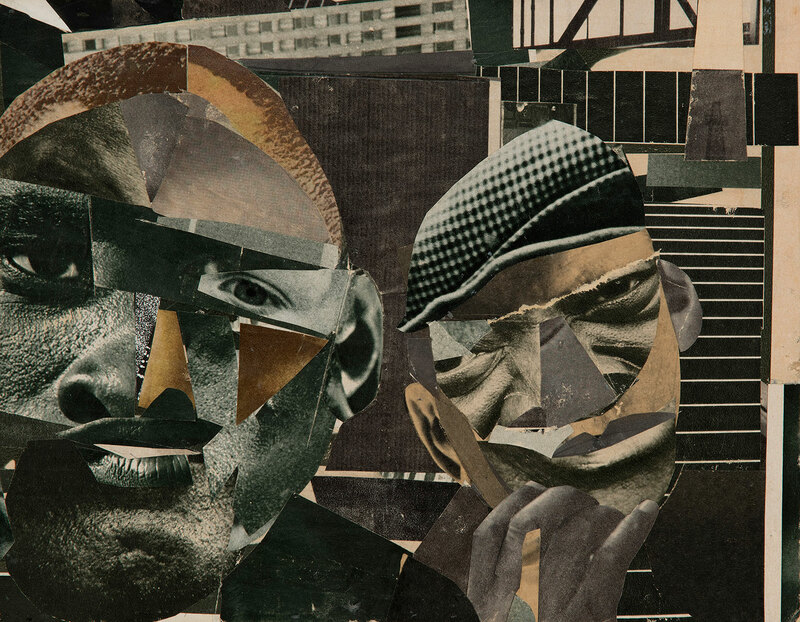 Romare Bearden: Pittsburgh Memory, 1964, mixed media collage of printed papers and graphite on board, 8½ by 11¾ inches. "The show opens in 1963 at the height of the Civil Rights movement and its dreams of integration. In its wake emerged more militant calls for Black Power: a rallying cry for African American pride, autonomy and solidarity, drawing inspiration from newly independent African nations. Artists responded to these times by provoking, confronting, and confounding expectations. Their momentum makes for an electrifying visual journey. Vibrant paintings, powerful murals, collage, photography, revolutionary clothing designs and sculptures made with Black hair, melted records, and tights – the variety of artworks reflects the many viewpoints of artists and collectives at work during these explosive times. Some engage with legendary figures from the period, with paintings in homage to political leaders Martin Luther King, Malcolm X and Angela Davis, musician John Coltrane and sporting hero Jack Johnson. Muhammad Ali appears in Andy Warhol’s famous painting. This landmark exhibition is a rare opportunity to see era-defining artworks that changed the face of art in America." NY Times: A Tate Modern Show Examines Race in the U.S.